York EMC Services Ltd, distributed in Australia by RFI Industries , has developed a unique reference signal source, the CGE03, operating between 900MHz and 40GHz. As EMC test facilities move towards the higher frequencies demanded by the new European and international standards, there is a requirement to validate such test systems on a regular basis as stipulated by ISO17025. At higher frequencies especially the risks of measurement errors being introduced are significant, and the consequences serious. Using a CGE03 as a known, good, signal source to carry out regular pre-operational checks on the measurement system, allows a test facility to mitigate against this risk. The same principle can be applied when comparing EMC measurement environments, either similar types on different sites or, say, the difference between a fully anechoic chamber and a reverberation (mode stirred) chamber. The shielding effectiveness of enclosures is another aspect of system design, which is undergoing change as operating frequencies increase. Above 2 or 3 GHz, the directional aspect of emissions is a greater factor than at lower frequencies. In addition to much military work being carried out in the 1–40 GHz band, the FCC requires that radiated emissions tests be carried out at the 5th harmonic of a high operating frequency. 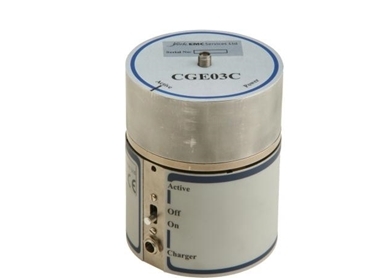 Physically small and battery powered (76mm diameter, 96mm tall including the battery pack), the CGE03 is ideal for such applications, when fitted with an appropriate antenna. Such a reference source is also valuable in the development and testing of components such as filters, cables, and connectors. The CGE03 is a comb generator emitter, with a switchable picket spacing of either 900MHz or 1GHz. Output power is a typical minimum of 60dBµV via a 2.9mm output connector. For applications where space is limited the comb generator can be detached from the battery pack and powered remotely.